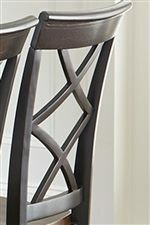 This side chair has several stylish details that will make your space unique. The piece features a double X back with a shaped cap rail. 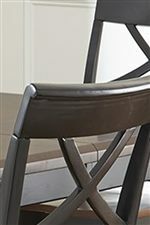 The chair has a two tone brown/black finish and rests on tapered legs. The scooped wood seat completes the chair's distinct look. The Rani Two Tone Side Chair with Scooped Wood Seat by Steve Silver at Walker's Furniture in the Spokane, Kennewick, Tri-Cities, Wenatchee, Coeur D’Alene, Yakima, Walla Walla, Umatilla, Moses Lake area. Product availability may vary. Contact us for the most current availability on this product. The Rani collection features a two tone finish that gives a space a more casual feel without giving up the intricate detail of a traditional dining room. The side chairs that are a part of this collection offer most of this detail. The double X seat backs serve as a focal point for the dining set and the scooped wood seat gives the collection another unique detail. 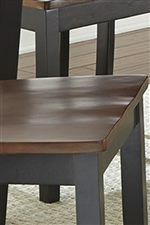 The dining table can fit in small spaces and can also accommodate more guests by extending it with an 18 inch leaf. The pieces are simple in design, but have the added benefit of distinct detail as well. The Rani collection is a great option if you are looking for Casual furniture in the Spokane, Kennewick, Tri-Cities, Wenatchee, Coeur D’Alene, Yakima, Walla Walla, Umatilla, Moses Lake area. Browse other items in the Rani collection from Walker's Furniture in the Spokane, Kennewick, Tri-Cities, Wenatchee, Coeur D’Alene, Yakima, Walla Walla, Umatilla, Moses Lake area.